Now that we have looked at whom to FOLLOW, it’s time to consider our FOLLOWERS and how to manage them. If you’ve been using Twitter for any length of time, you will have already started to follow a few people or organisations. You may also have looked with envy at some of the ‘celebrities’ you are following and the huge numbers associated with them. I know that these are exceptional examples, but even so: Stephen Fry is heading for a following of 3 million whilst he chooses to follow about 53,000 of them. How many tweets can he be expected to read every day, let alone interact with? President Obama has close to 9 million followers, of which he follows 700,000. Really? Do you think he is sitting in the Oval Office engaging with the tweets of all those people? It is useful from the start to have a clear strategy to help you to decide who to follow. Many ‘old hands’ on Twitter would have us believe that the only ethical strategy is to FOLLOW-BACK everyone who follows us. Yeah, right. Barrack Obama following 9 million tweeps makes a lot of sense. When you actually look at how these people manage their accounts, we soon see that the bulk of those they are following are confined to a general Twitter stream that is never looked at. Where are the ethics in that? Let’s not forget that Twitter is SOCIAL MEDIA, and as such we surely want to build a community with whom we can ENGAGE and INTERACT. When deciding who to follow, my strategy is very simple. It will come as no great surprise to my regular readers that I apply my FIRE principle here too. I want to follow people who are Fun because they brighten my day. I also want to read Interesting tweets on a whole range of different topics. Otherwise I want to read tweets that are Relevant either to me, my life or my business. Finally I want to follow people who are Experts in their chosen field. By applying this strategy I know that I am building a small but valued following who are adding value to my life, as I hope I am to theirs. Yes, I do follow some people who are not so much engaging as BROADCASTING. That’s because they broadcast good CONTENT, so the FIRE filter is happy. I follow those who I respect as gurus in their field e.g. Social Media. A word of caution about gurus, however: I get to decide who they are, not them! If anyone declares themselves to be a guru then they are likely to be suffering from terminal vanity and not worth the follow. My measure of value in all things is ‘have I learnt something’? From Twitter I am learning new things every day. Some broadcasters are simply pushing themselves, their products, or their angst, so they fail the test of FIRE. These people are using Social Media for self-promotion and forgetting to be, ah yes…. SOCIAL! Buys lists of followers – they are easily spotted. If you are looking for likely FIRE worthy followers, then start by looking at the FOLLOW lists of those that you already follow. Also take note of anyone who they choose to RETWEET. Of course you are now well on the way to the first 100 valued tweeps in your interactive and engaged community. You might be starting to wonder how you’re going to cope with all this Fun, Interesting, Relevant and Expert information streaming in. There are many third party software applications to help with this. My personal favourite is Tweetdeck…but more of that next time! Twitter Thursday #5: Who Do I Follow? If you’ve been following this blog series, you will hopefully be using your Twitter account to communicate Fun, Interesting, Relevant and Expert tweets to all your followers. But who are you following? How do you find followers and why do you follow them? Usually the first people you follow will be a few friends or family members who are already using Twitter. You might then search out some ‘celebrities’ to follow. This can be fun for a while, but you will soon want to engage with people more fully and to start building your Twitter community. 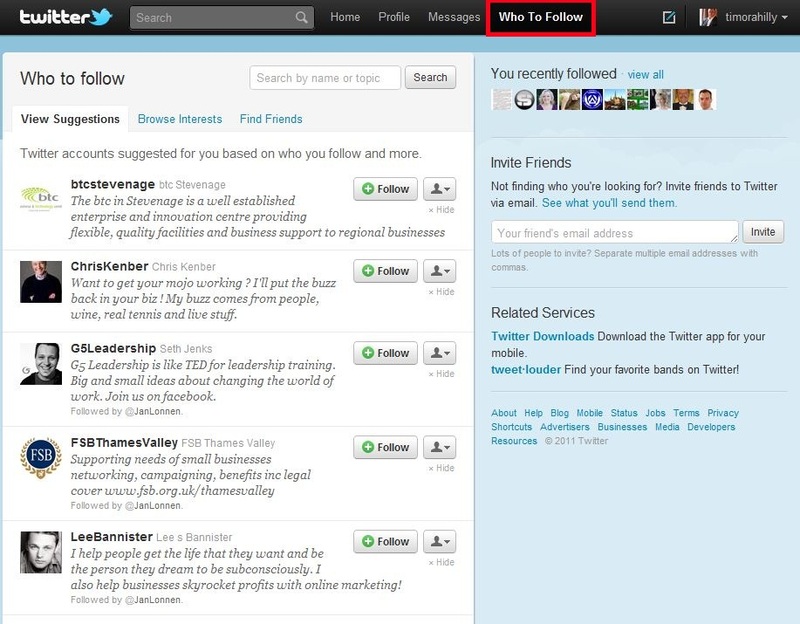 A good way to start looking for people to follow is to click on the WHO TO FOLLOW tab on your home page. This will show you a list of suggestions for people to follow based on anyone you are already following. On this page you will also see a SEARCH bar and an INVITATION option too. The SEARCH bar allows you to look for topics or people of interest to you. The 'Who To Follow' page. Note the outlined 'Who To Follow' link in the upper-right corner! Here again I suggest that you apply my FIRE principle to anyone you might want to follow. Are they Fun, Interesting, Relevant and Experts in what they do? The INVITE option allows you to search for friends or followers by name. If your search is successful, simply click on the green FOLLOW button and you are done. Once you choose to follow somebody, every time they tweet an update, you will see it in your timeline. When you choose to follow somebody, it does not mean that they are following you. They will have to opt for that themselves. If they do choose to follow you, then your tweets will appear to them too. Of course once you have seen somebody’s tweets, you may feel that you no longer wish to follow them. This is easily resolved by simply clicking on their name and then on the green FOLLOWING button. That person will then become UNFOLLOWED by you and you will no longer see their updates. It is worth noting that Twitter applies strict rules regarding aggressive following. By default, every user can follow a maximum of 2000 people. If you reach this limit, Twitter will then limit your following ability. This limit is different for everyone and is based on the ratio of your followers to your following. 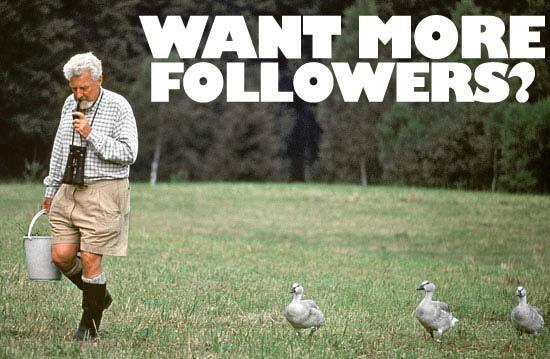 Next time we will address the difficult problem of how to attract followers yourself. More importantly, we will consider whether you need a follow-back policy to help manage your growing community. In the Basic Tools post a couple of weeks ago, we looked at the use of the HASHTAG or #. I’ve had a lot of feedback about this topic, and as promised, I’m returning to it in more detail. To recap: placing a hashtag (#) before any word in a tweet makes it easier for someone to find it using the SEARCH function above your Twitter timeline. By using this tool, all tweets on the same topic (like #bigevent2011, say) can be found in the same place. It’s a great way to keep all contributions to a twitter conversation together. For this reason, hashtags are often used by the participants on training days or by delegates at a conference. 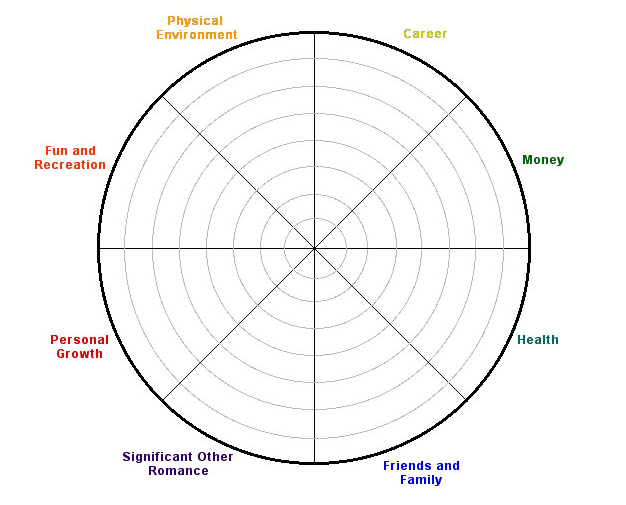 Be creative about how you use this tool. What about implementing a family hashtag to use during a family Twitter conversation? Remember of course that all tweets in a hashtag group are still public, and your messages will still appear in your own TIMELINE. Also remember F.I.R.E: be Funny, Interesting, Relevant and be an Expert in the topic you’re tweeting about! I mentioned before that a popular hashtag on Thursday evenings is #BBCQT, which is associated with the weekly BBC’s Question Time programme. Another great example on Thursdays is #UKEdChat. This is a ‘virtual staffroom’ where hundreds of teachers all over the UK come together between 8 & 9pm to tweet about previously set topics. A great new hashtag is one set up by the Twitter expert Mark Shaw (@markshaw). He recently decided to establish a mutual referral system, with the tag #rfr (requestions for recommendations). Mark sends out an #rfr request every day, so that people can gain new business while helping others to do the same. This is just the type of relationship-building which Twitter is great for. For other ‘weekly’ hashtags, check out #musicmonday or #charitytuesday. I’ve also set up #wedswisom for my own weekly choice of inspirational quotes on Wednesdays. 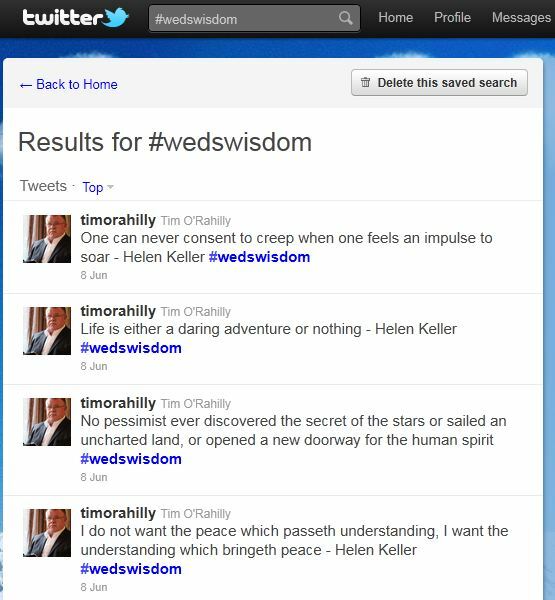 An example of a search for the #wedswisdom hashtag. Try it yourself! Of course, one of the most popular hashtags is #ff, or ‘Follow Friday’. Many people use this as a way of mentioning those followers who they wish to thank, promote or advocate to their other followers at the end of the week. The #ff hashtag itself should ideally be within the middle of the tweet somewhere, rather than right at the end or right at the beginning. Many people do #ff tweets with nothing but a list of mentions attached. In my opinion, this is a very poor way to acknowledge your respected followers. I believe that you should have just one or two mentions per tweet, with a reason given for nominating them. This ties in with the whole ethos of developing meaningful online relationships and with building social capital. You may have noticed a list of TRENDS on the right-hand side of your Twitter timeline. This will show the most talked-about hashtags or topics across Twitter, and can be tweaked to show what is being talked about either globally or else filtered by local area. These are not linked in any way to your followers or your own tweets. Why not join in with some of these conversations?